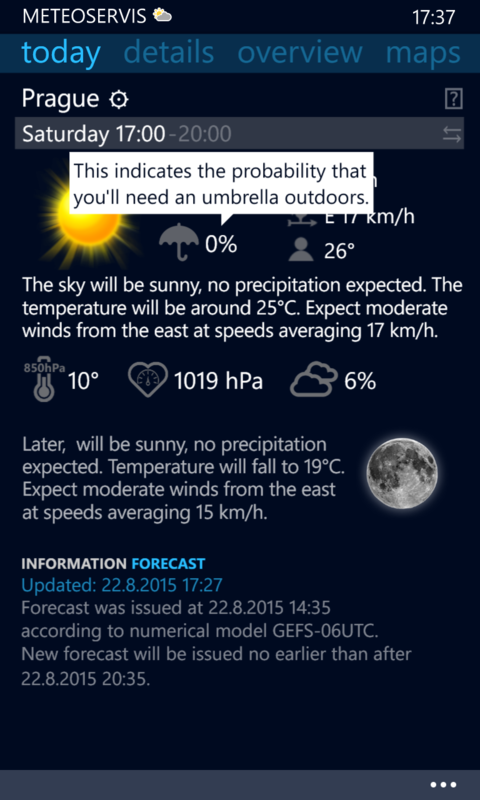 There is a plenty of weather apps in the market which provide weather forecast and other meteo information. But these are mainly focused on presentation or nice icons on the main screen. But what’s about reliability or accuracy? Most of such applications just shows forecast from other weather-servers or weather websites. Displayed data are mostly poor and limited to only raw information about expected day or night weather with simple temperature ranges. But it says nothing about how the weather will change during the day, which is often necessary and important for outdoor activities planning. And don’t forget about the current weather conditions like rain, which is coming soon to your location. 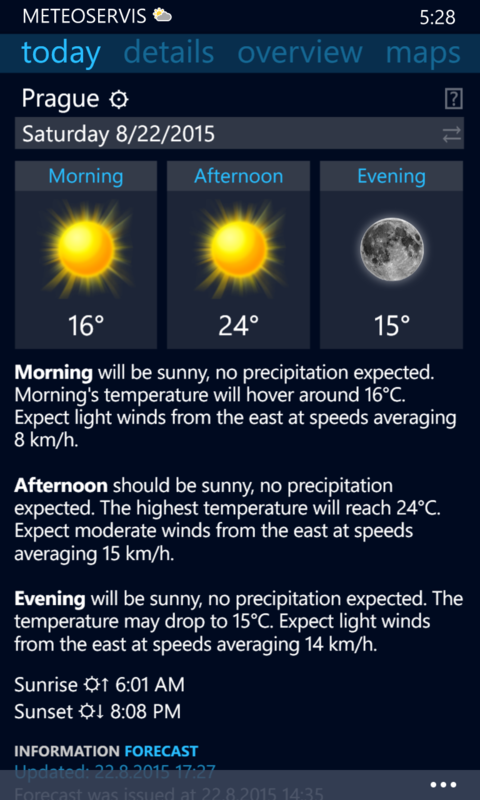 Meteoservis is different weather application. Unlike most similar applications, Meteoservis directly interprets outputs of numerical models and provides complex weather service for Czech a Slovak Republic territory. Detailed forecast is available in three-hour intervals, so you always have a complete overview of how the weather will change during the day or night. 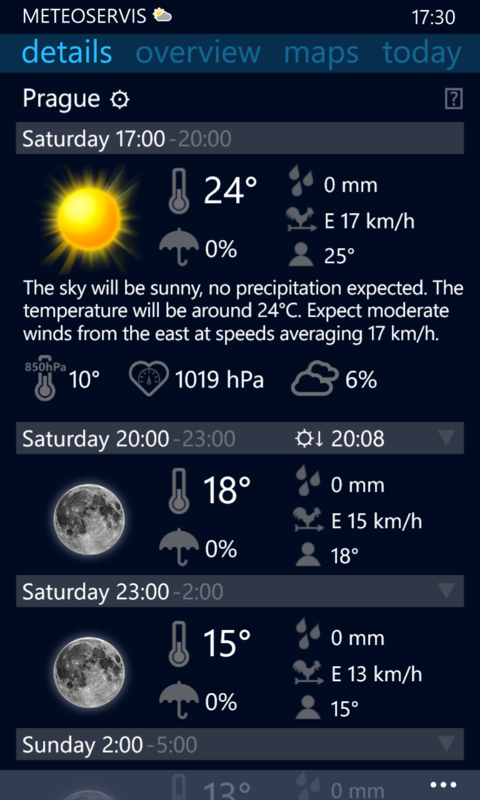 Meteoservis is award-winning and one of the most popular weather application in Czech Republic. It’s a comprehensive weather service with professional background – build and maintained by professional developers with meteorology knowledge. Meteoservis is continually evolving and improving, and is actively used by more than 60000 users. Even Meteoservis is currently targeted to Czech and Slovak territory we plan to extend the service to whole Europe soon. Meteoservis is using publicly accessible, but very good weather prediction model as a source of data, focusing mainly on the territory of the Czech Republic and Slovakia and provides high quality and accurate weather forecast. However, that it is still just a prediction that does not always coincide with reality. Professional background. It’s a complete weather service build and maintained by professional developers with meteorology knowledge. Detailed weather forecast. Forecast is available in three-hour intervals, so you always have a complete overview of how the weather will change during the day or night. Unlike most similar applications, Meteoservis directly interprets the output of numerical model instead of showing forecast taken over from other weather-servers or weather websites. Meteoservis uses its own web server, where all necessary data are collected, adjusted and optimized in order to minimize data transfers. Optimized for small amount of data (a few kB) transferred over network and therefore very cheap operation even when connected via GPRS/EDGE. Displays amount of predicted rainfall in a given interval, atmospheric pressure, and the perceived temperature (Windchill / HeatIndex). Actual rainfall information i.e. doppler radar data for the Czech Republic and Slovakia. And of course, information about the current distribution of clouds i.e. satellite images of Europe. Available are also advanced information about the current weather condition like synoptic situation in Europe, current temperatures in the Czech Republic and Slovakia or lightning activity map. Further possibilities and information will progressively grow in future releases. You can set the temperature compensation to compensate places with higher altitude or warmer microclimate inside cities. Great for outdoor activities planning. Continuous development of the application, official site and discussion forum. 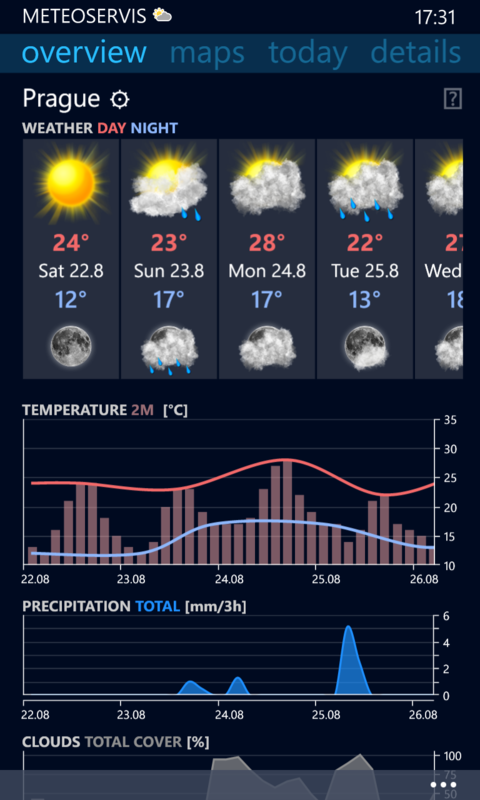 Award-winning and one of the most popular weather application in Czech Republic. See more. Please, read carefully system requirements and frequently asked questions for this application. The application is available for the Windows Phone or Google Android operating system. 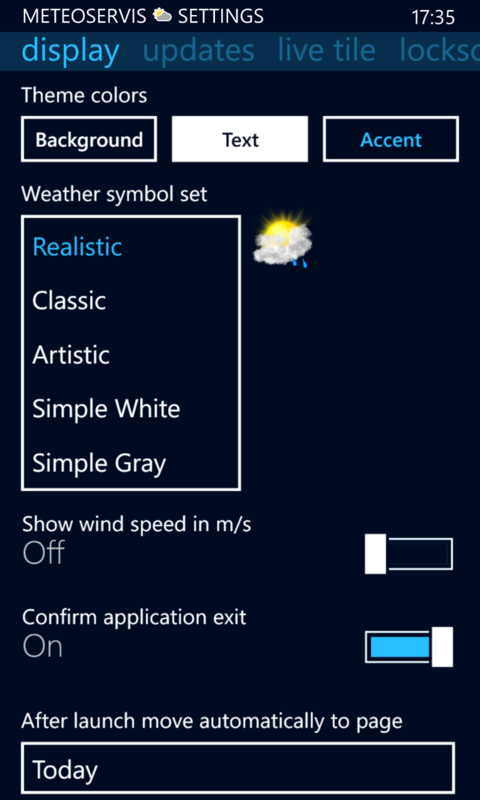 Meteoservis for Windows Phone is available in several editions, which differ in their capabilities and the amount of data displayed. Some functions can slightly vary or may not be (even temporarily) available. Our goal of course is to make available and consolidate all functions on all platforms. For specific information on Meteoservis for your system, click on its logo.